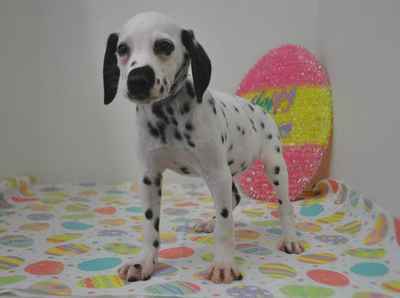 The Dalmatian’s delightful, eye-catching spots of black or liver adorn one of the most distinctive coats in the animal kingdom. Beneath the spots is a graceful, elegantly proportioned trotting dog standing between 19 and 23 inches at the shoulder. Dals are muscular, built to go the distance; the powerful hindquarters provide the drive behind the smooth, effortless gait. The Dal was originally bred to guard horses and coaches, and some of the old protective instinct remains. Reserved and dignified, Dals can be aloof with strangers and are dependable watchdogs. With their preferred humans, Dals are bright, loyal, and loving house dogs. They are strong, active athletes with great stamina—a wonderful partner for runners and hikers.